Creating a company branded R Markdown template that includes a logo and branding colors. Updating the default YAML settings to include standard fields for title, author, date, or default output options. Customizing the layout of the output document by adding additional fields to the YAML metadata. For example, you can add a department field to be included within your title page. Once created, templates are easily accessed within RStudio, and will appear within the “New R Markdown” window as shown in Figure 17.1. 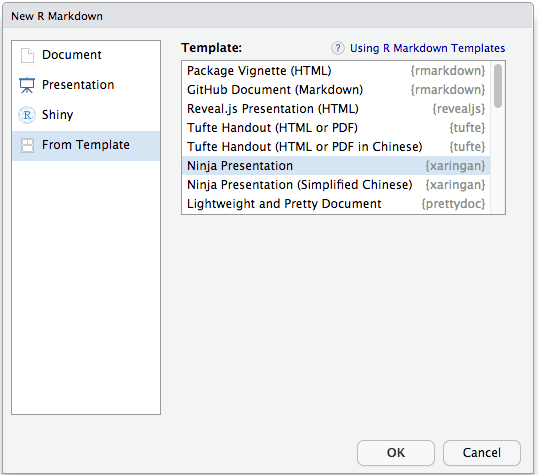 FIGURE 17.1: Selecting R Markdown templates within RStudio. This chapter explains how to create templates and share them within an R package. If you would like to see some real-world examples, you may check out the source package of rticles (https://github.com/rstudio/rticles). The rmarkdown::html_vignette format is also a relatively simple example (see both its R source code and the template structure). In addition, Michael Harper has kindly prepared more examples in the repository https://github.com/mikey-harper/example-rmd-templates.